475 Beacon is located on the south side of Beacon, between Hereford and Massachusetts Avenue, with 473 Beacon to the east and 477 Beacon to the west. 475 Beacon was designed by Obed F. Smith, architect, and built in 1889 for Uriah H. Coffin, a building contractor, for speculative sale. He is shown as the owner on the original building permit application dated March 11, 1889, and on the final building inspection report, dated October 29, 1889. Uriah Coffin purchased the land for 475 Beacon on November 13, 1888, from Frances Anne (Codman) Sturgis, the widow of architect John Hubbard Sturgis. The lot was part of a 375 foot parcel John H. Sturgis purchased on January 24, 1880, from a real estate investment trust formed by Grenville T. W. Braman, Henry D. Hyde, and Frank W. Andrews. The trust had purchased the land from the Boston Water Power Company on March 1, 1872. The 375 foot parcel was one of three John H. Sturgis had purchased in January and February of 1880 comprising all of the land on the south side of Beacon from a line 198 feet west of Hereford to Massachusetts Avenue, with a frontage of 442 feet. 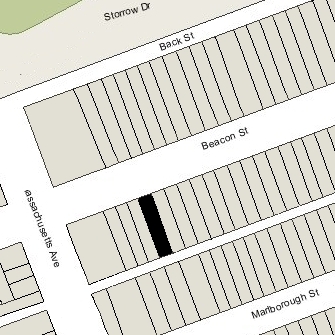 Click here for an index to the deeds for 475 Beacon, and click here for further information on the land on the south side of Beacon between Hereford and Massachusetts Avenue. On February 2, 1891, 475 Beacon was purchased by Thomas M. Smith, an auctioneer, who transferred it on the same day to Mathilda (Matilda) (Abrams) Berwin, the wife of real estate dealer Jacob Berwin. Thomas Smith and Jacob Berwin shared the same office address and probably were business associates. The Berwins previously had lived in Roxbury. Jacob and Mathilda Berwin continued to live at 475 Beacon during the 1894-1895 winter season, after which they moved to The Belvoir at 636-638 Beacon. By the 1898-1899 season, they were living in an apartment at The Imperial at 308 Commonwealth. On January 5, 1895, 475 Beacon was purchased from Mathilda Berwin by Lucy E. (MacKibbin) Pettingill, the wife of Ubert K. Pettingill (Pettengill). They previously had lived in an apartment at 220 Marlborough. Lucy Pettingill’s mother, Mary E. (Vail) MacKibbin Bacon, the widow of James MacKibbin and of Eben Bacon, lived with them. Ubert Pettingill was an advertising agent and later a newspaper advertising manager. The Pettingills only child, Ubert Kent Pettingill, died in March of 1905, and Mary Bacon died in May of 1905. Ubert and Lucy Pettingill moved soon thereafter to Brookline. Lucy Pettingill continued to own 475 Beacon and lease it to others. By the 1905-1906 winter season, 475 Beacon was the home of wool merchant Samuel Gibson Adams and his wife, Abbie Louise (Fisher) Clapp Adams. They previously had lived at 284 Marlborough. Two of Abbie Adams’s sons by her previous marriage, to Erstene Follen Clapp, lived with them: Charles Erstene Clapp, a stockbroker, and Joseph Albert Clapp. Charles Clapp married in September of 1906 to Bernice Spaulding and they moved to Winchester. Samuel and Abbie Adams, their daughter, Louise, and Joseph Clapp continued to live at 475 Beacon during the 1906-1907 winter season, but moved thereafter to 278 Commonwealth. By the 1907-1908 winter season, 475 Beacon was the home of Richard Augustine Farrelly and his wife, Katherine A. (Bouton) Farrelly. He was a editor with the Hearst newspapers. They continued to live there during the 1908-1909 season, but had moved to New York City by 1910. By the 1909-1910 winter season, 475 Beacon was the home of Dr. Gardner Wells Hall, a physician, and his wife, Elizabeth Hancock (Page) Hall. He also maintained his medical office there. They previously had lived (and he had maintained his office) at The Charlesgate at 535 Beacon. Elizabeth Hall’s mother, Anna C. (Hancock) Page, the widow of Kilby Page, lived with them until 1914, when she moved to 535 Beacon. The Halls continued to live at 475 Beacon during the 1916-1917 season, after which they moved to 396 Marlborough. 475 Beacon was not listed in the 1918 and 1919 Blue Books. By the 1919-1920 winter season, 475 Beacon was the home of Annie Shillaber (Tripp) Monteith, the widow of Edwin Harris Monteith, an iron and steel broker in Cincinnati. She previously had lived in Jamaica Plain. Annie Monteith’s daughter, Evelyn Monteith, lived with her at 475 Beacon. She married in April of 1925 to Ralph Alexander MacGilvra, an insurance underwriter. After their marriage, they lived in Wellesley. Lucy Pettingill died in 1922, and on March 23, 1923, 475 Beacon was acquired from her estate by Thomas E. Dempsey. On January 18, 1924, it was acquired from him by Effie Jane Blake (Morley) Giesser, the wife of Ernest A. Giesser, an accountant. They lived in Dorchester. And on January 29, 1924, it was acquired from Effie Giesser by Margaret Kissock and Jessie Kissock, sisters, who lived in Brookline with their unmarried brother, George, a real estate broker. 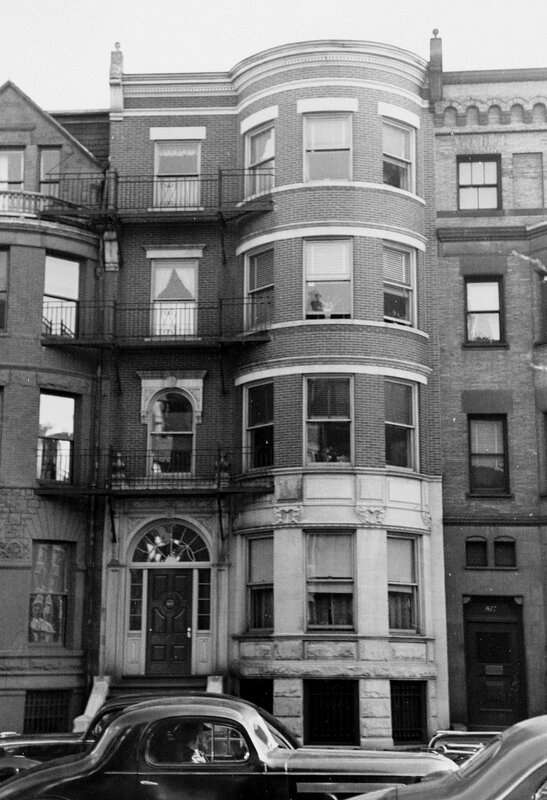 Annie Monteith continued to live at 475 Beacon during the 1927-1928 winter season, but moved thereafter to Cambridge. In February of 1928, the Building Department issued a violation notice for insufficient egress at 475 Beacon, which indicates that the property was being used as a multiple dwelling, probably a lodging house. The violation was addressed to Charles D. Kissock, the brother of George, Margaret, and Jessie Kissock, who worked for George Kissock’s real estate office. On July 11, 1929, the Insitution for Savings in Roxbury and Its Vicinity foreclosed on a mortgage it held on 475 Beacon and took possession of the property. 475 Beacon was not listed in the 1929-1934 Blue Books and was shown as vacant in the 1930-1934 City Directories. On June 12, 1930, 475 Beacon was acquired from the bank by Charles H. Hemenway. He probably acquired the property on behalf of real estate dealer Edward J. Ball, who filed in July of 1930 for permission to convert the property from a single-family dwelling into eight apartments. He subsequently abandoned the permit. On February 5, 1931, the bank foreclosed on its mortgage to Charles Hemenway and took back possession of the property. In March of 1934, the Institution for Savings applied for (and subsequently received) permission to convert the property from a single-family dwelling into nine apartments. On January 24, 1935, 475 Beacon was acquired by real estate dealer Wallace Raymond Marden. He and his wife, Marjorie Lewis (Maclary) Marden, lived in Hingham. On June 28, 1940, he transferred the property to his sister-in-law, Helen Elizabeth (Maclary) Baader, the widow of Albert Stanley Baader, as trustee of the Early Realty Trust. On July 20, 1953, 475 Beacon was acquired from Helen Baader by Rose Rochelle (Goldberg) Levin Glazer, the former wife of Reuben Levin and Max L. Glazer. She was a pianist and entertainer who performed as (and legally changed her name to) Rose Rochelle. She lived in an apartment at 273 Beacon. On June 23, 1954, 475 Beacon was acquired from Rose Rochelle by Irving Brody. On October 2, 1961, 475 Beacon was acquired from Irving Brody by John Jacques Beaubien and James Sutherland Ambrose. They lived in an apartment at 212 Commonwealth. James Ambrose died in October of 1962. On March 27, 1963, 475 Beacon was purchased from James Beaubien by Alvin L. Lipsky, trustee of the Alvin Lipsky Realty Trust. On March 3, 1980, 475 Beacon was purchased from Alvin Lipsky by Anthony M. Rando, trustee of the 475 Beacon Street Trust, and on September 2, 1980, it was purchased from him by Northwell, Inc. (Harry Wolfsthal, president and treasurer). 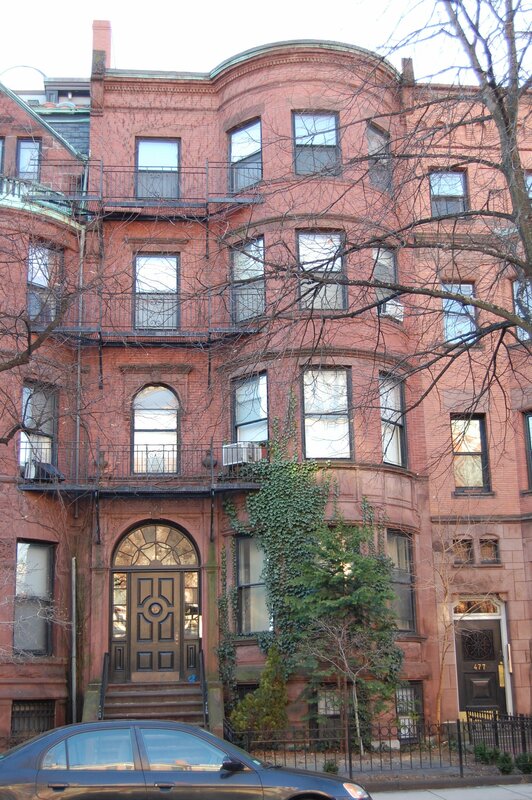 On November 3, 1981, Northwell, Inc., converted the property into nine condominium units, the 475 Beacon Street Condominium.